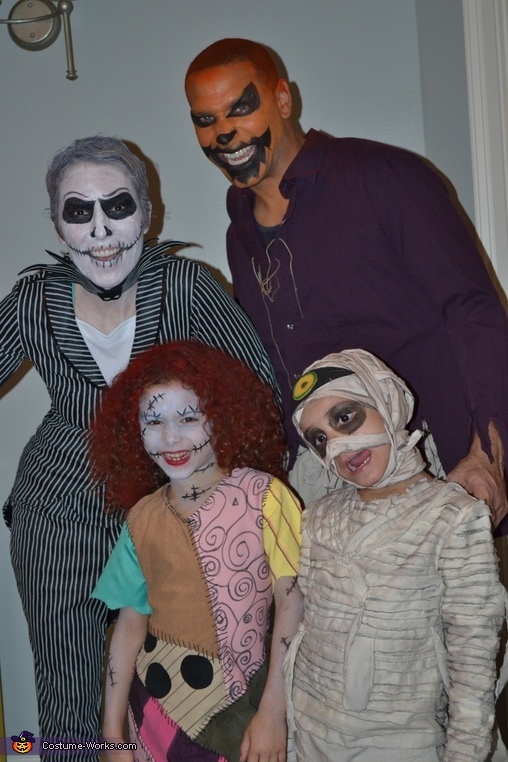 The homemade costumes are sally and the mummy. The idea came from the movie NIGHTMARE BEFORE CHRISTMAS. My daughter wanted to do a family themed Halloween party, so NIGHTMARE BEFORE CHRISTMAS was chosen. My granddaughter wanted to be Sally and my grandson wanted to be the mummy (2x in a row for Halloween). The sally dress was created by drawing a pattern on wrapping paper from the dollar store and cutting it into pieces. Once the fabric was cut, the design on each piece was hand drawn with a permanent black marker. Each piece was sewn together by machine. Once the dress was sewn together, an invisible zipper was put in on the back of the dress and all the stitching was then hand sewn. All of the trimming of the sleeves and hem were done using pinking shears. Also a matching dress was made for my granddaughter’s American doll. On the other hand, the mummy outfit was very time consuming. I purchased about 5 yards of muslin fabric. A pattern was created for the base of the costume. Once the top and bottoms were cut out, I ripped up a multitude of 2-3” strips. I sewed the strips to the top and bottoms. Once the strips were sewn, I sewed all the pieces together. The dirty look came from eye shadow (used 3 compacts) from the dollar store and black permanent marker. Each strip was painted with brown/black eye shadow (very messy) and outlined with black marker. I didn’t finish the neck/sleeves and top/bottom. In case my grandson wanted to be mummy next year ... and lastly a Velcro strip was used on the back of the top for easy access. Elastic was used for the pants. For both costumes, the cost to make was approximately $75.00. And that’s the gist of it.